What is a Workshop? A workshop is a chance to get friends together (your house or mine) to get creative and earn some free Stampin' Up! products. BEFORE: I'll give you a set of postcards for you to use to invite your friends. I'll also create a facebook event for you to share with a host code in case anyone who can't make the workshop wants to place an order. Let me know if there are any particular products or techniques you want to try at your workshop. DURING: At the workshop, just have some drinks and snacks for everyone and leave the rest to me! I'll prep the supplies for everyone to make 3 quick an easy projects: an envelope, a card, and a treat. Everyone will also get a free copy of the Annual Catalog and a supply list. ​Anyone who ﻿hosts a qualifying ﻿workshop﻿﻿ (either at your house or mine) can choose one free gift from my grab bag, in addition to the Stampin’ Rewards. AFTER: I generally like to close the workshop on the night of the event, so be ready with your wishlist of how you want to spend your Stampin' Rewards! 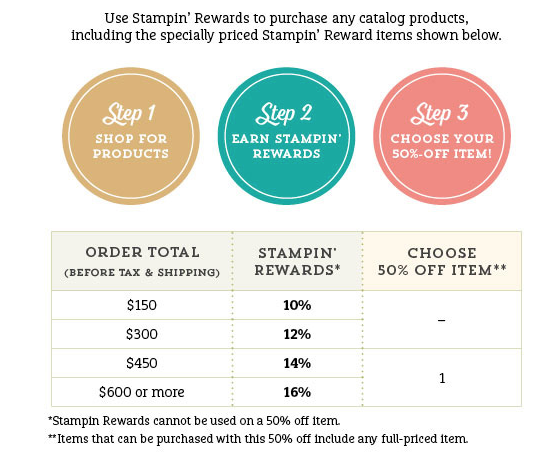 You can also use your Rewards to apply toward the $99 Starter Kit! See the chart below on what you can earn! As a thank you for hosting, you'll also get to choose one free item out of my Grab Bag! Email me now to schedule a date! Keep your eye open for a "Mystery Hostess Party", your chance to win the Stampin' Rewards when you place an order! The biggest Mystery Hostess drawing each year is at Craft Night in December. Place an order starting Dec. 1st until Craft Night where the winner is drawn. You can also find a Mystery Hostess drawing at the Craft-A-Thon in March; if the "party" reaches $150, we'll draw a winner at the end of the event.